Jonathan Toews (19) reacts with teammate Andrew Shaw after scoring against the St. Louis Blues in the third period of the Blackhawks’ Game Six victory. 0-2 becomes 2-2 becomes 4-2 becomes Round 2. Spotting the St. Louis Blues two games turned out not to be such a bad thing after all. After six games and four wins in a row, the Chicago Blackhawks righted their ship completely and are now advancing to the next round of the Stanley Cup Playoffs after its 5-1 victory in Game 6 Sunday afternoon. As the game first unfolded, St. Louis brought the energy but the Hawks brought the first goal as Bryan Bickell tipped home his second goal of the playoffs, giving the home team an early 1-0 lead in front of an United Center crowd that was as loud as expected. The Blues fought back when TJ Oshie netted home his second goal of the playoffs off a slap shot, tying the score at 1-1 after the first period. More momentum picked up for the Blues as they drew three penalties on Chicago in the second period, but they were unable to capitalize on any of their power play opportunities, eventually leading them to their demise. As the third period began, the Hawks took control right from the start and starting off the scoring pace was Jonathan Toews, who delivered his second goal of the playoffs on the power play less than a minute in to give the Hawks a 2-1 lead and all the lead it would need for the rest of the game. But the Hawks paraded more offense into this first round victory lap. Next came Patrick Sharp, who got on the board for the first time in these playoffs, extending the lead to 3-1 just over a minute after Toews. Andrew Shaw would then be heard from as he scored on a tip in, his second of the playoffs and defenseman Duncan Keith ended the afternoon with his second goal of the playoffs off a wrist shot giving the Hawks a 5-1 final in front of a now elated home crowd. Hawks goalie Corey Crawford stood on his head, stopping 35 of 36 shots while posting a save percentage of .972. On the other side, Blues goalie Ryan Miller finished the series as he played it out, by being outplayed. Miller stopped only 22 shots and posted a .815 save percentage. The Hawks showed their dominance in various categories, leading in faceoff wins (35-34) and blocked shots (20-13). I remind Hawks fans to keep these statistics in mind as the Hawks continue their march through the playoffs. CHI –– Duncan Keith posted four points in Game 6 (1 goal, 3 assists). CHI — Marcus Kruger lead the team in blocked shots (5). CHI — Bryan Bickell lead the team in hits (4). CHI — The penalty kill unit shut down the Blues’ power play (6-6). 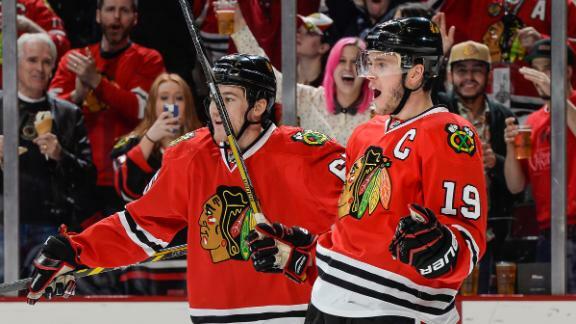 CHI — Sporting an 11-2 record in series-clinching games under coach Joel Quenneville. *To NBC for showing the National Anthem with singer Jim Cornelison rocking the sold out United Center crowd. *To the Hawks fans, who as Game 6 winded down began to chant “COREY…COREY,” showing their love and support to the very deserving goaltender Crawford as the Hawks move forward in the playoffs. CHI — Marcus Kruger and Marian Hossa lead the team in penalty minutes (4). STL — Vladimir Tarasenko and David Backes combined for zero points in Game 6. STL — Went 0 for 6 on the power play. A final depressing stat leading to the Blues’ demise and their summer vacation. It was a tough series for the Hawks, likely tougher than they’d like, coming back from an 0-2 deficit while being consistently outhit by the Blues. If there’s one thing that the Hawks should learn from this series, it is to stay disciplined and not play your opponent’s game, dictate the pace for all 60 minutes every time. Also, they should have learned how crucial it is not to self destruct in late game situations like in Games 1 and 2. Chicago will get a much needed break after going through this physical battle, including its four overtime contests, while they wait for the conclusion of the Colorado Avalanche/Minnesota Wild series. Both teams could give the Hawks a challenge but will it match what the Blues threw? Can the Hawks set the tone in the next round and not fall so far behind? We will find out as the second round begins later this week.